Most of us are new to making money online and have heard that affiliate marketing is the most popular online business to start with. We want to start exploring and making money like most people do. But, have you heard that only 3% of the marketers do succeed in this business. 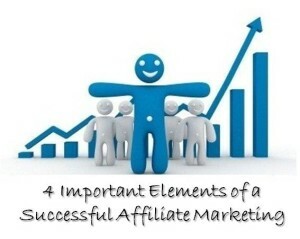 If you want to be part of the 3%, you need to understand these 4 important elements of a successful affiliate marketing before you have the potential of making money from your affiliate program. Make sure your content and product are relevant to your visitors so that you can expect a better conversion rate. For example, if you have targeted women between 20 to 25 years old and you are selling women’s clothing as an affiliate to this target group, and then you add men’s shoes to the group. I would bet that you fail miserably as you have not matched your visitors to your content and the product. So, make sure that you make relevant matches if you expect to be rewarded with potential sale generation. There are many affiliate programs in the internet so it is important that you choose the right one. The one that you feel comfortable with and have trust. Your visitors need to have trust in you and your affiliate program, which can increase the likelihood of a sale when you market the product. Traffic to your site or blog is key. If there is no traffic to your site, there will be no sale. To increase the possibility of a conversion, you need to bring traffic to your site. And the traffic has to be targeted and relevant. That’s where keywords and search engine optimization come into play. Putting all these components together can help to make money with your affiliate programs. Your main challenge is to convert your targeted traffic by offering them something like “a free ebook”, or “a free report” or anything that’s relevant to your site and affiliate program. Once they are converted, you can make periodic offer to them and hopefully sell them something that is of value. Finally, you need to position yourself as an authority. Affiliate programs don’t do well if you just put up a banner across the top of the screen or at the sidebar. Conversion will still happen but will not be better than when you position your product ads. For example, if you write about a specific product and then place a link to that product within your content, your conversion rate will double or even triple in some cases. Do you see the different. By putting the above 4 elements together will help to turn your affiliate program into a money making machine. Does this article help? Is it easy to understand? Share your thought by leaving your comment below. I just keep on reading; everything you have to say here is really helpful especially if you need to brush up on your knowledge! Thank you for writing this all in a very easy to use manner. Hi Rene, really appreciate your endorsement. Your comments shall give me the needed urge to do more. Thanks a lot. Thanks, Mark. More to come.